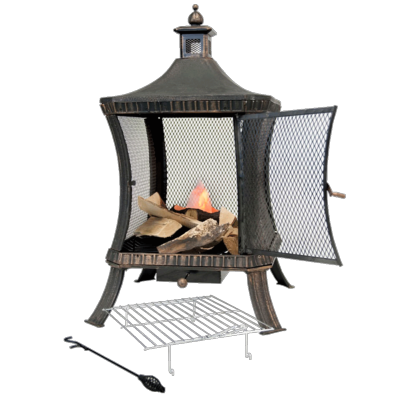 This large wood burning fire pit is made from painted cast iron to provide a rustic feel and also providing warmth through the cool summer evenings. The protective spark screen will help keep escaping embers to a minimum, built in ash catcher and easy cleaning and maintenance. This fire pit can be used as a barbecue with the cooking grill included. Very heavy at 43Kg so will stay in place on the patio.